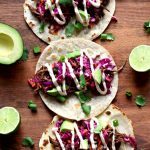 Pressure Cooker/Slow Cooker Korean Beef Tacos—tender shredded seasoned beef is rolled up in a warm tortilla with crunchy cabbage, diced avocado, chopped cilantro, sriracha sour cream and a splash of roasted garlic seasoned rice vinegar. When you bite into this taco it’s like a party in your mouth. All the flavors and textures come together in a perfect union. This is one of those recipes that everyone in my house went gaga over. It is the perfect combination of flavors and textures and I think you need to add it to your menu this week stat! Let’s start with the meat: the beef is cooked in your electric pressure cooker or your slow cooker until fall apart tender. I used a cross rib roast, but you can also use a chuck roast. The sauce that it is cooked in has a base of tamari, sesame oil, minced garlic, ginger and NAKANO® Rice Vinegar. When I opened my pressure cooker I let out a little yelp because I was so excited on how tender the beef came out. It was so easy to shred. Once shredded keep it in with the juices that it was cooked in for maximum flavor. Toss a little extra rice vinegar in with the meat for a burst of flavor. 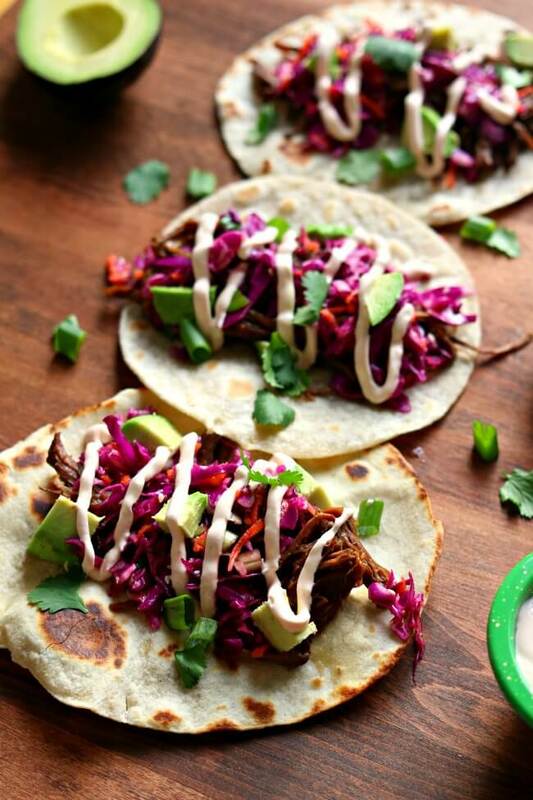 Then use a slotted spoon or tongs to dish the meat up into your tortilla. 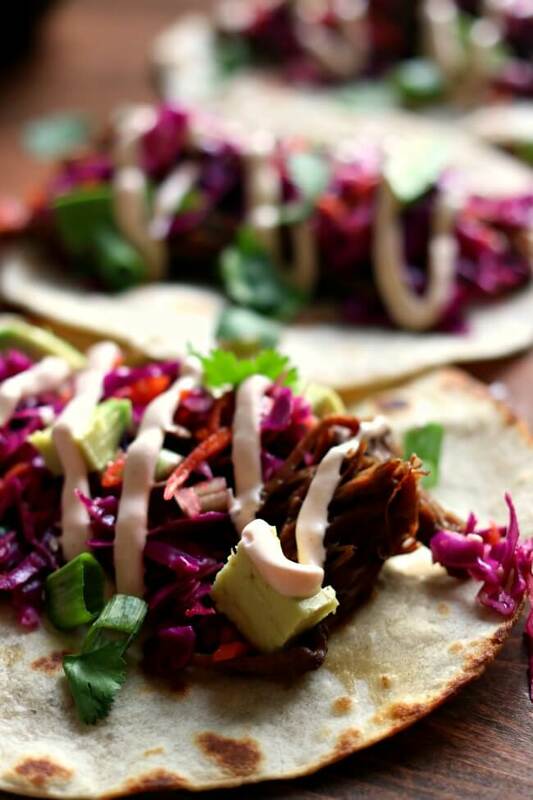 The tortillas: usually when I read a recipe for Korean tacos they are rolled up in a corn tortilla. I am not really a fan of corn tortillas but I do like the size of them. I bought uncooked fajita-size flour tortillas in the refrigerated section of my grocery store. To cook just place them on a hot pan for about 30 seconds on each side. They are a hundred times better than already cooked tortillas. I promise. The slaw: I don’t really like the word “slaw.” I guess it reminds me of the cole slaw that was served in our elementary school cafeteria made with green cabbage and mayo(?). Not appetizing. This slaw, however, is the bomb. Purple cabbage is chopped with carrots and green onions and then tossed with a dressing of lime juice, sesame oil and sesame seeds. Very simple to make but adds so much to the taco. 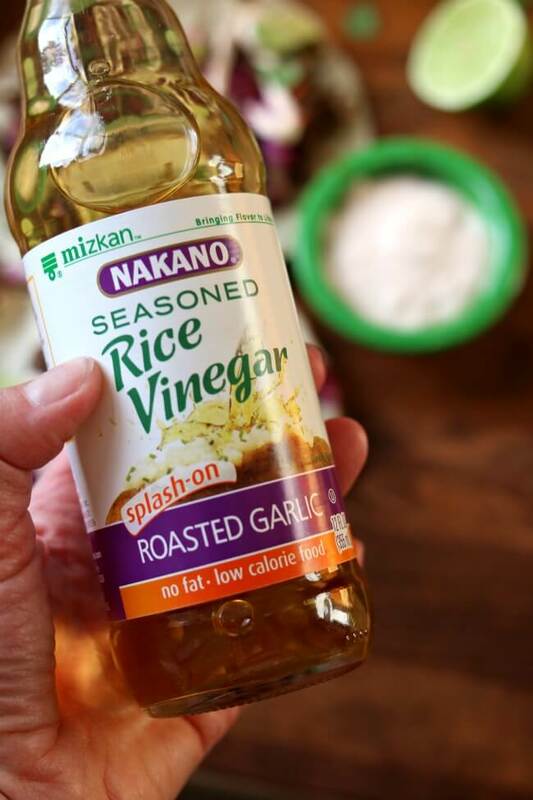 I’ve had such a fun time incorporating NAKANO Rice Vinegars into my meals lately! I made lettuce wraps with ground chicken and the vinegar gave it a splash of savory flavor without a ton of calories. I love using rice vinegar in my salad dressings too. So much flavor without all the fat. Instead of adding butter to my broccoli I splashed on some of the roasted garlic vinegar and saved myself 80 calories! 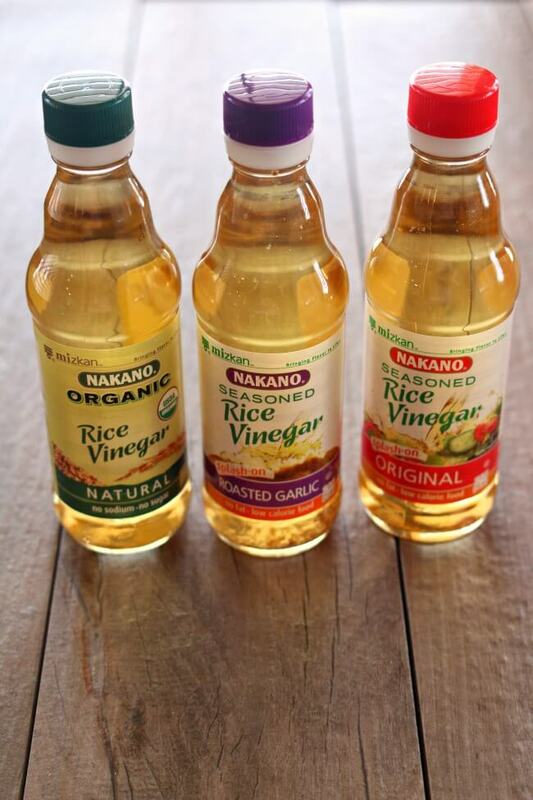 You can find NAKANO Rice Vinegars at your grocery store. I found mine at Walmart and Kroger. Usually they are next to the salad dressings and pickles. They are available in seven varieties (2 of which are organic). My favorites are the roasted garlic and the basil and oregano. They are a healthy substitute which we all need after an indulgent December, am I right? And for your convenience here is a NAKANO Coupon. 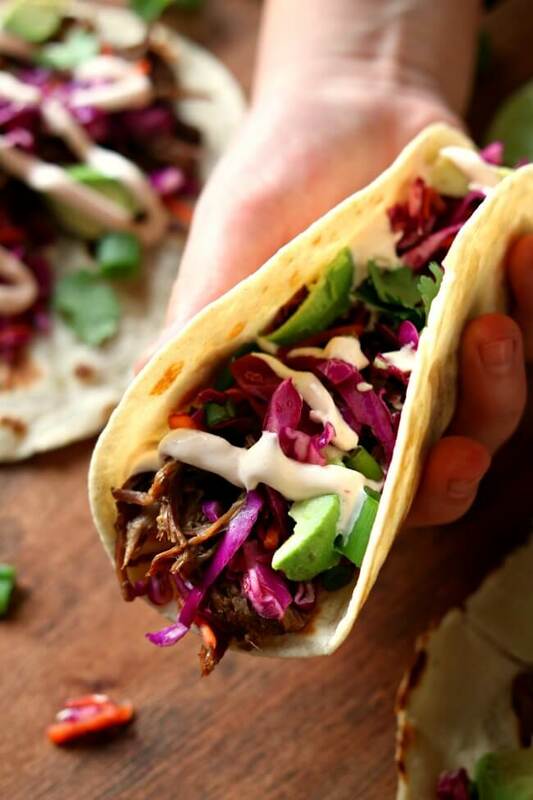 Tender shredded seasoned beef is rolled up in a warm tortilla with crunchy cabbage, diced avocado, chopped cilantro, sriracha sour cream and a splash of roasted garlic seasoned rice vinegar. When you bite into this taco it’s like a party in your mouth. All the flavors and textures come together in a perfect union. Cut the beef in half. Place in the pressure cooker or slow cooker. In a small bowl whisk together the brown sugar, tamari, garlic, beef broth, ginger, rice vinegar and sesame oil. Pour the mixture over the beef. If using a slow cooker, cover and cook on low for 8-12 hours, until tender. If using an electric pressure cooker. Cover and secure the lid. Make sure valve is set to sealing. Press the manual button or pressure cook button (high pressure) and adjust the timer to 80 minutes. Allow the pressure to release naturally for at least 15 minutes. If you can do a full natural pressure release that is best. Mine took almost 25 minutes to completely release on its own. Remove the lid and shred the beef. Return beef to juices. In a bowl, toss all the ingredients together for the cabbage slaw. Prepare sriracha sour cream by stirring together the 1/3 cup sour cream with the tablespoon of sriracha. Prepare the uncooked tortillas as described on its packaging. Mine literally took one minute to cook. Scoop some of the meat onto the tortilla. Top with some cabbage slaw, sriracha sour cream, cilantro and diced avocado. Splash a bit of rice vinegar over the top. Fold up the taco and enjoy! I could only find a bottom round roast. Will it shred the same or do I need to cook it longer? LOVE your recipes! They’ve made it so much easier to learn how to use my instant pot! We’ve loved every one of them so far! I would cook for 90 minutes! Made this and it was so good. I’d like to make it again for a dinner party but would like to serve it with a side dish or appetizer of some sort. Any ideas? 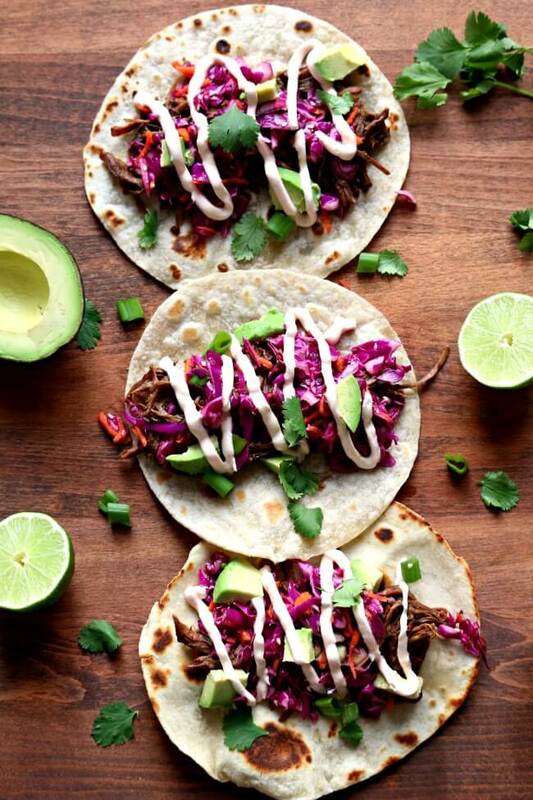 I swear there was a different Korean beef taco recipe on this site before Jan 2018. Looking forward to trying with my Bunco group of 12!!!! I think they’ll really like it! This recipe was only the second thing I made in our new Instant Pot and it was delicious. My wife no longer thinks the Instant Pot was just another extravagant purchase by her gadget-loving husband, so that’s a big win. I found that adding all the juices back into the meat made it a little too moist, next time I’ll be a bit more cautious to get the right consistency. I presume this is dependent on the particular chuck roast. My family decided this was the perfect Valentines Day dinner while watching the Olympics! Soooo good, and my daughter is glad there is lots of left over slaw for her to eat tomorrow – she said that was the best part! And I did halve the sugar. So happy that you loved this recipe. We loved it so much! the slaw is the best! this was one of the best things i have ever made! per advice of a friend, i used flank steak, which was nice and lean. i was afraid of the ‘8-12 hours on low’ (because dinner might not have been ready until 9 pm) so after an hour, i put the crock pot on high for 4 hours, then back on low 4 hours. i also cut the brown sugar in half, for both the meat and the slaw, which were both still so delicious that i could have left the sugar out completely. i believe truvia makes a brown sugar substitute now too. low net carb wraps and i can keto- on! thank you so much for this recipe! This looks amazing. But like a previous comment, is there something we could substitute for the brown sugar?.. Looking forward to hopefully making this. The company just served this for lunch to all of us. Yummy, to die for! Had to look up the recipe so I can try it at home. I can’t wait to try this recipe. I love tacos all kinds. Spicy is the best. Thanks for the post. All the ingredients look agreeable to me. I think you’ll really like it Susie! 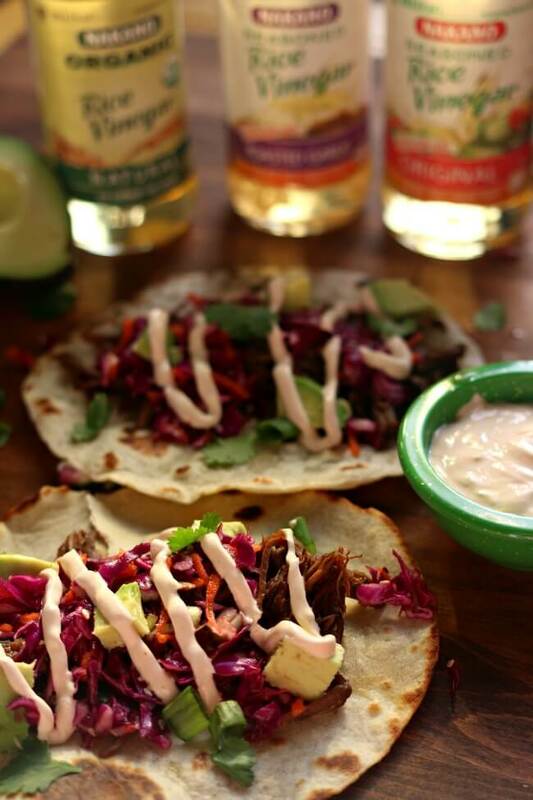 Quick and easy with wonderful flavors. I could eat these tacos for days. I also made the slaw to go with it and it was delicious too. I love the garlic rice vinegar so much I added it to the slaw. Great dinner and thanks for the recipe. Nice Elaine! I’m so glad you liked them. I want to make them again this week. Just made this for dinner and everyone gave it 2 thumbs up!!! So flavorful and delicious. I can see making a large amount for a great party food also. After we scarfed them down I remembered I’d forgotten the avocado! I’m sure it would’ve made them even more amazing! This looks delicious! I just wanted to double check the pressure cooking timing. It’s 80 minutes? I’m new to the instant pot world but have only been cooking things in there for less than 30 minutes so I wanted to make sure it’s not a typo. Thanks! You had me until sugar. 2 tsp of sugar per serving! I wonder if people would find food so appetizing if they pictured filling up a beautiful, healthy, colorful taco, then sprinkled 2 tsp of sugar on top of each one. It sure looks pretty, though! I really wanted to try it! You can leave the sugar out. If you don’t like an ingredient or allergic to something, either leave the ingredient out or ask for suggestions for a substitute or read reviews of how others have tried. And no it’s not the same as sprinkling sugar on top of the taco, I’m just not sure how that comment even adds to the discussion. Thank you, Karen, for sharing your recipe.